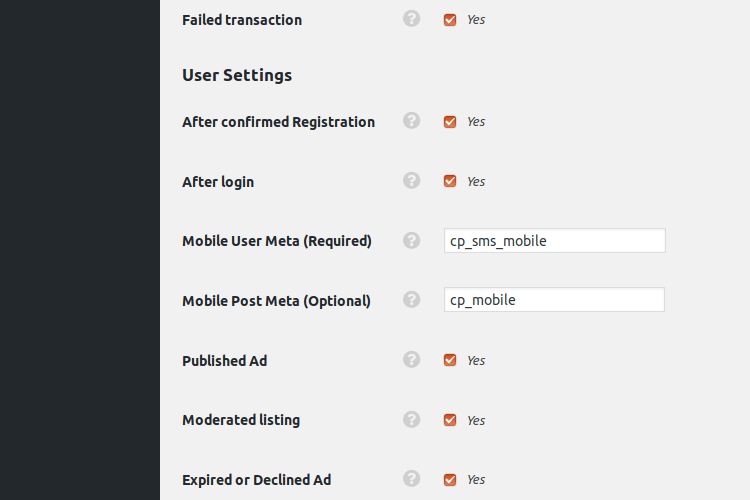 This plugin is for receiving SMS notifications for ad sites using ClassiPress theme. If you are using ClassiPress then this plugin is a great way to get notification sent to your phone via SMS. This plugin will allow ad owners to receive SMS notifications when there are any changes to their ads. By default, notifications for these changes are sent out via email. This can be unreliable sometimes as emails can get lost. SMS notifications are far more reliable and easier to access. You can use these notifications to monitor your ad site efficiently even when you do not have access to your emails. 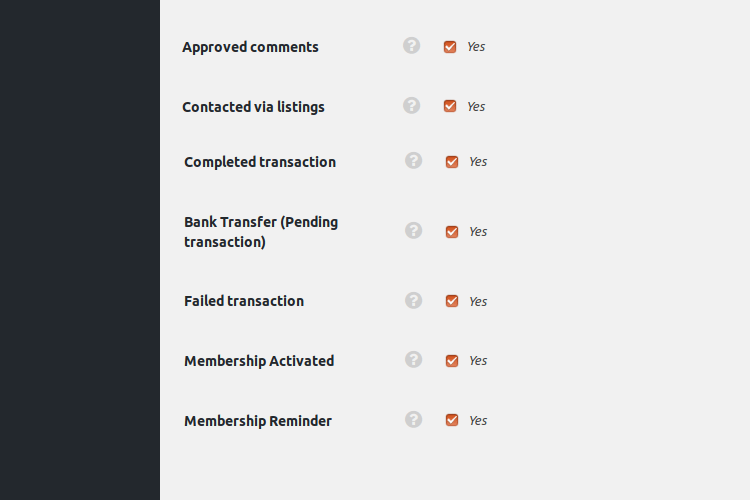 The following events have notification options in this plugin. You can also specify multiple cell phone numbers. This is perfect if you have more than one admin that you want to receive these notifications. When the user has logged into the site. This SMS will include the IP of the logged in user. First of all, you have got to be sure all below requirements are OK. Ask your SMS gateway provider for their requirements. 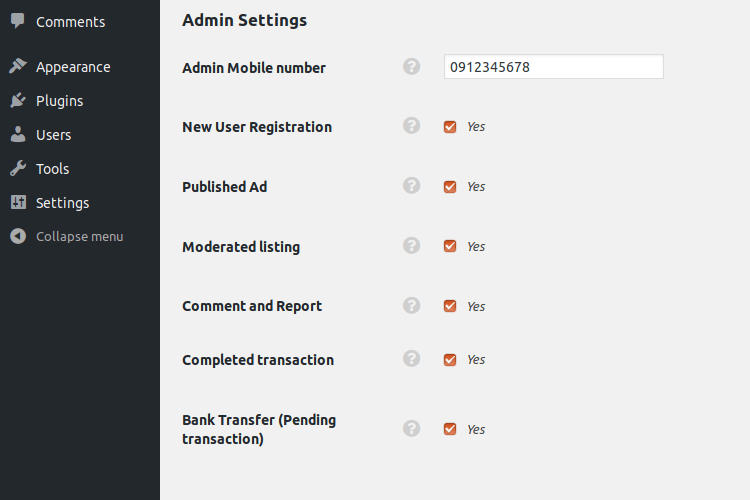 Install and activate ClassiPress from “WP-Admin >> Themes” page in Wordpress Admin panel. 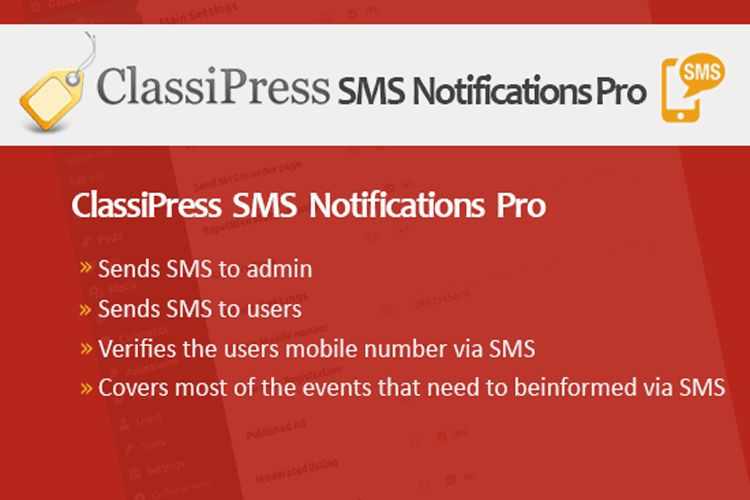 Install this plugin and activate ClassiPress SMS Notifications Pro from “WP-Admin >> Plugins” page in Wordpress Admin panel. You can contact us directly via email (faragatepay@gmail.com). I just purchased plugin and test it with twillo its works great, its cover all aspects in classipress i was looking for this long time, Thank you. Please consider opening support forum for purchased members. Thanks alot for good review and thanks for your suggestion about forum. Hello, what is the expected cost for each SMS message that will be sent? I love the plugin capabilities, but a lot of people on a busy site with a lot of messages could end up costing a lot…? Thanks. Hello, the cost of SMS is different, it is related on your SMS Gateway provider. you must ask this question from your SMS Gateway provider. Hi, Looks like a great plugin and just what I need. I use ClassiPress with a child theme called AdSplash. Does is supporth this also? if your child-theme coding is standard, yes it will work well. I purchased your great plugin that works like a charm (via Twilio in my configuration). I have a question about custom variable. In my contact form I added a field but none of these expression works. Could you help me to display this custom field please ? thanks for purchase. contact with email only for this case. now you can buy from this page. Will this plugin compatible with other WP Themes? Will this work with any SMS gateway worldwide? 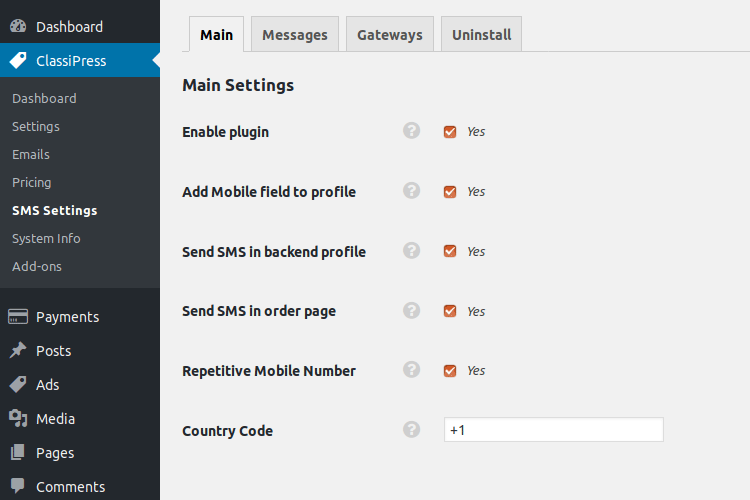 the supported sms gateways are in product description. Can this plugin work as a messaging service between buyers and sellers on A ClassiPress classified ads website? I purchased this plugin already for classipress. I end up not using the SMS verification for new users due to charges by SMS provider. How can I make the phone number of the user appear on the user’s profile? It does not show up in the user’s profile. How can the buyers see the phone number of the seller? What is your CP Version? Hi, will this plugin work for Flag/Report ad? How do I setup that a new user needs to confirm his profile by giving mobile phone from a specifiy country only? Limiting to country code will be add in futures version. What if I have a different SMS gateway ? Can it be configured if I have an API ? Adding new gateway will be considered soon. But now i have busy. Send your api documentation to reviews. – Is verification of mobile done on registration or login ? – if user doesn’t get verification code ? – Is there an option to resend verification code ? – Is it possible to verify a phone phone without code from backend ? 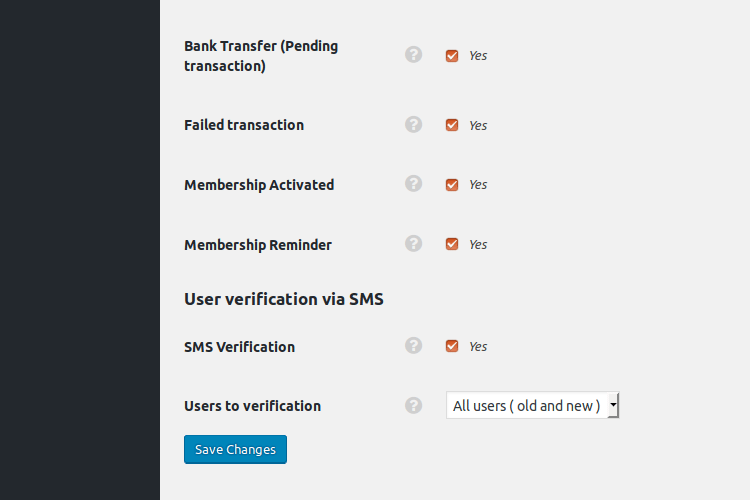 – Is there an option to send sms to all the registered users ? – Can we send sms to only those users who have active ads on the website ? -in first login verification will done. – the verification codes will saved it user profile in w-admin. If users didnet get, the sms will send him to next try. -yes you can verify from wp-admin manual. -bulk send to all users didnet consider yet. Another problem (SMS sent out twice) still persists! I checked plugin and sms sends only one time. I need see your wp to review and find your conflict. Also you are 1 person that have this problem.